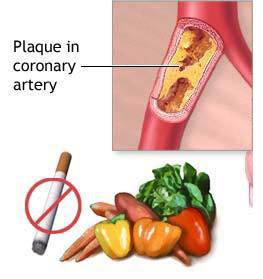 It is a condition in which fatty material collects in the walls of the arteries. Over time this fatty material increases, thickens and hardens due to calcium deposition and narrows the artery, eventually blocking it. It is a common disorder affecting the medium and large arteries. Fat, cholesterol and other substances build up within the wall forming plaques. These plaques over time harden, narrow the artery and make it less flexible, making it hard for the blood to flow easily. The reduced oxygen – rich blood flow in the heart causes angina followed by heart attack. These plaques may break-off in the fast flowing blood, travel to other parts of the body (embolism) and obstruct the blood supply to that portion of the body by blocking the artery leading to death. The hardened plaque may tear causing an ulcer or fissure over which clot develops occluding the artery leading to stoppage of blood flow – heart attack, stroke or leg gangrene. The plaques weaken the wall leading to aneurysm formation. You can control most risk factors and delay or prevent the atherosclerotic process. Diabetes – this is a disease in which the blood sugar levels are too high because the body is not making enough insulin or is not using the insulin properly. Insulin is a hormone that moves sugar into the cells where it can be used properly. If it does not happen we call it insulin resistance. Heavy alcohol abuse - damages the heart muscle promoting atherosclerosis. Men are allowed 2 pegs a day while women one peg per day. Unhealthy diet – this increases risk of atherosclerosis – foods that are high in saturated and trans fats, cholesterol, salt and sugar worsen other atherosclerotic risk factors. Increasing age raises risk of atherosclerosis. In men it is after 45 while in women it is after 55 years. Obesity is when there is extra amount of body fat while overweight is when there is extra weight from muscles, fat, bones and water. Family history of heart disease – risk increases if father or brother has heart disease before 55 years or mother and sister have heart disease before 65 years. Smoking – it damages the blood vessels, raises cholesterol levels, raises blood pressure and prevents oxygen to reach body tissue. Lack of physical activity causes unhealthy blood cholesterol levels, high Blood pressure, diabetes, overweight and obesity. The emerging risk factors are C-reactive protein (CRP). The higher the CRP the more the atherosclerotic process. In women the triglycerides increase the chances of atherosclerosis. Perhaps there is a genetic element which has not yet been isolated. Sleep apnea – here one or more pause in breathing occurs during sleep or you take shallow breaths while you breathe. If untreated you have high blood pressure, diabetes, heart attack or stroke. Stress – this is those commonly reported to trigger heart attack particularly anger.It affects every organ of the body. These depend on which organ is being affected by the decrease in blood flow: heart attacks, strokes, leg pain and gangrene, kidney disease, hypertension etc. Again they depend on the organ involved. The narrowed artery may create a bruit sound with a stethoscope. Blood tests – fats, cholesterol, sugars and proteins – may show you at risk of atherosclerosis. It includes life style changes, medicines and medical procedures or surgery. Life style changes – avoid fatty foods. Eat well balanced meals low in cholesterol and fat. Several daily servings of fruit and vegetables. Eat fish twice a week, but not fried fish. Alcohol no more than one peg a day. Daily exercise 30 min daily and if obese about 60 – 90 mins daily. Regular blood pressure checks once a year and keep if below 140/90 mmHg. Check cholesterol every 5 years and if high every 6 months. Keep LDL (bad cholesterol) below 130 – 160 mg/dL. Statins help lower plaque formation. May require aspirin and clopidogrel regularly if cardiac problems. Folic acid, Vitamin E & C and antioxidents are no longer recommended for heart disease.